Below is the write up from my Gliding Club's blog. I flew in my glider - WUN. An early morning briefing by Ross Hall and Mike Ridge, then great cross country gliding, a sausage sizzle by Keiren and Michelle, and a de-briefing to end the day and everyone went home very happy, even the instructors. Four more pilots had discovered the excitement of going cross country. The task was set by Mike Ridge and we all headed off about 1130 into a sky full of low but numerous cumulus. First objective was, find a good thermal and take it to the top then head off in the task direction to the first turn point, the square dam outside Beaudesert. Once over the hills and into the Beaudesert valley there are plenty of long flat fields to think about while searching for a thermal. David in WUN and John and Ken in NTT had raced ahead and were well onto the next stage. Ross and Denis in GUE and Richard in WVK flying together made it easily to the square dam but then struggled for a while until discovering lift from the moist air directly over the dam. Adam and Steve in GKX and Mike and Kieren in BGE had not yet managed to get out of the Boonah area. The next turn point was Rathdowney, up the Beaudesert valley with its long flat paddocks and always in glide of Kooralbyn strip. This is a comfortable leg of the task. WUN and NTT well ahead, GUE found a big thermal over the hills and was quickly over Rathdowney, WVK could not get anywhere so headed for the safety of Kooralbyn. 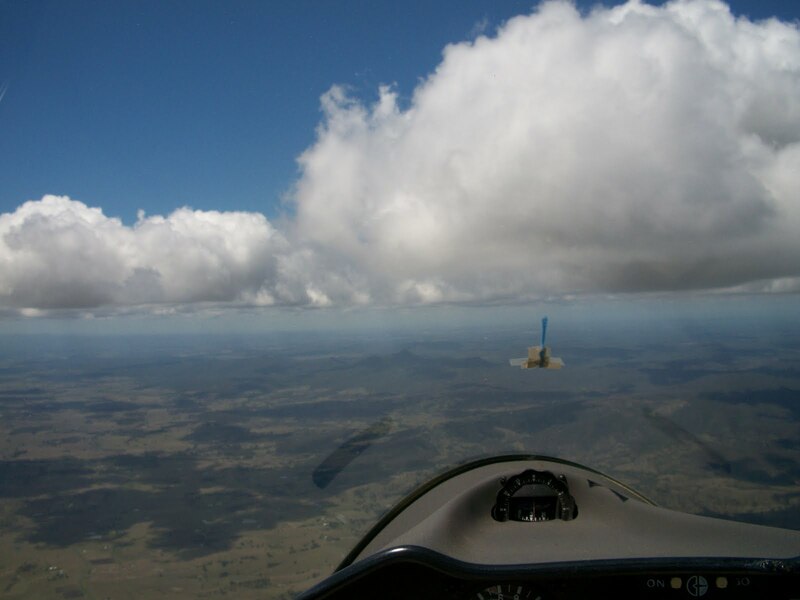 GKX was now over Beaudesert and on their way to setting the fastest time of the day. BGE failed to get out of Boonah area and was struggling to get back to the strip. The next turn point was Maroon dam wall and then back to Boonah. The out-landing options from Rathdowney to Maroon do not look very inviting but once past the dam wall there are once again plenty of options all the way back to Boonah. WUN and NTT finished early, GUE had an easy glide back from the dam wall at 100kts arriving at over 2000ft. WVK managed to find some lift over Kooralbyn and used this to head straight for home. GKX arrived home in just over an hour with an average speed of around 90 km/hr. The next club day is planned for 18 December. It is great fun, don’t miss it. Looks like you're still enjoying your hobby in the newly discovered area. Nice to get a life-sign, everything ok overthere? Greatings from a white and chilly Holland. Yes I havent been out flying for more than 2 months due to the wet spring weather...wettest since records began. Even I am glad not to live in the UK! Enjoy your summer and a lot of gliding.Looks exciting. Yes the UK always seems to get more snow than Holland. I enjoy going out to the gliding club and meeting people (Inge and I dont mix much). If/when you ever come to visit then I'll take you for a passenger flight!